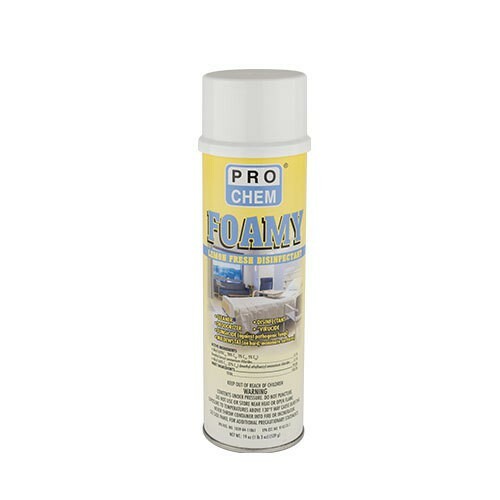 Foamy Lemon Fresh | Pro Chem, Inc.
FOAMY LEMON FRESH is designed specifically for general cleaning and disinfecting homes, hospitals, nursing homes, schools and hotels. It is formulated to disinfect inanimate hard surfaces. 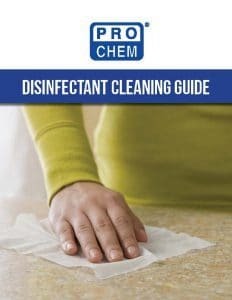 This product also deodorizes those areas which generally are hard to keep fresh smelling, such as garbage storage areas, empty garbage bins and cans, basements, restrooms and other areas that are prone to odors caused by microorganisms. When used as directed, FOAMY LEMON FRESH exhibits effective disinfectant activity against organisms including Staphylococcus aureus, Salmonella choleraesuis, Pseudomonas aeruginosa and HIV-1 (associated with AIDS) and meets AOAC Germicidal Spray Products Test requirements for hospital disinfectants. Shake can before using. Hold container six to eight inches from surface to be treated. Spray area until it is covered with a white foam. Allow foam to penetrate and remain wet for 10 minutes. No scrubbing is necessary. Wipe off with a clean cloth, mop or sponge. For heavily soiled areas, remove gross filth or heavy soil before treatment. To control mold and mildew on precleaned hard non-porous surfaces, spray surfaces to be treated with FOAMY, making sure to wet completely. Let air dry. Repeat application at weekly intervals or when mildew growth reappears.